In a move which compromises the trust between GPs and their patients, the Tory Government is instructing GPs to stop giving sick notes to ill and disabled patients who are appealing benefits decisions, even though they need them to get the benefits they rely on. As a result, the health of disabled people is being further damaged by this inhumane government who, despite being condemned by the United Nations for the way the UK is treating the disabled and those in poverty; continue to persecute those who are ill and infirm, as well as continueing to increase the level of poverty in this country. Indeed, the link between poverty caused by Universal Credit and claimants being forced into prostitution is well established in areas of high levels of poverty. Anti-poverty charity, Z2K have uncovered this scandal and got an influential MP to start demanding the Government changes its policies. 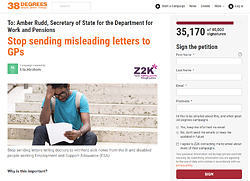 They have also set up a 38 Degrees petition with the aim to get tens of thousands of the public to sign it, and thereby build up enough public pressure to expose the government’s actions. Those who have been denied social security payments can still get payments whilst they appeal against the decision to cut their social security payments, but only as long as they still receive sick notes from their doctor. The government however, are sending misleading letters to GPs, instructing them to stop providing sick notes, in order for the DWP to stop paying them during the Appeals procedure which can take up to 12 months! One such case is exemplified by the 38 Degrees petition being emailed to supporters and members of the campaign group. The campaign group say that 69% of ill and disabled people win their appeals, but these letters block many from getting benefits until the appeal is over.